This is your first and only warning that this how-to will be both EPIC in length and in detail. Over the course of the past 12 months, I have been able to start, grow, measure, and monetize this very blog. A post like this would have saved me a lot of time and frustration. So today I am going to detail the entire process of creating a blog to ultimately flipping on the monetization switch. I am going to write the post that I wish I had when I launched Gen Y Finance Guy. This comprehensive guide will also act as a standing resource that I can point people too who reach out for my help, and there have been a lot of you doing that lately. As you all know I am all about sharing and full transparency, but I am also very much about scalability. Frankly, the growing number of request is becoming a bit much for me to keep up with, thus this guide. Don’t you hate those how-to posts that never really delve into the nitty-gritty details? Or what about those guides that only give you one piece of the puzzle? My promise to you is to be as detailed, specific, and as thorough as possible. The reality is that there are actually a lot of moving pieces when it comes to creating a successful blog. Thankfully advancements in technology have made the process manageable for normal folks like you and me. 1. People who want to start a blog but don’t know where to start. 2. People who figured out how to start a blog but need help with growing, measuring, and monetizing. 3. Seasoned bloggers who want to optimize their earning potential online (specifically with passive income through ads and affiliate marketing). 4. Everyone else. You have your reasons. Disclaimer: The blueprint I am about to layout is based on my own experience and research. Also, you should know that some of the links below are affiliate links and I will earn a commission if you purchase through those links. I have used all of the products listed below and recommend them because they are helpful and are companies that I know, like, and trust. Now that we got that out of the way, shall we start? It has never been easier to get a blog up and running. You should know before you get started that this blogging thing is a lot of work if you want to do it right. Getting up and going is the easy part, the hard part is keeping to a consistent writing schedule. This is why it is imperative that you choose a topic that you are passionate about, something that you could talk and write about all day long. This hardest step in this entire process is choosing the right topic. You don’t want to make the mistake of choosing the wrong topic. The possibilities are really endless. Make sure you choose a topic that you really enjoy talking about. Now, you will get mixed advice out there on the web. One camp will tell you to niche down as much as possible, you know like going an inch wide and a mile deep on a topic. While the other camp will tell you that niche-ing down isn’t necessary. The problem I find with really niche-ing down is that it feels very confining and for a non-conformist like myself, that just doesn’t work. Let me give you an example. Before I landed on Gen Y Finance Guy I threw around the idea of starting a blog around investing with options. This is something that I love to talk and teach people how to do, but it is only one of many interests I have under the personal finance umbrella. I even went as far as registering the domain name “theoptionstrading.club”. Knowing my personality I knew it was too narrow of a topic and that if I was going to make this blogging thing work that I would need more variety than that. So I opened up the aperture until I finally landed on the very broad topic of Personal Finance. This is the stake in the ground that creates a solid foundation for my blog. You may need to go through this same soul-searching process. What are some of the topics of your favorite blogs? What kinds of questions do your friends and family constantly come to you with? What are your favorite books about? What are the skills you have that you get paid to do? Will the topic be relevant 1-year, 3-years, and 5-years from now? Could you easily come up with at least 100 post ideas to write about? What is missing from the world that you think you could provide? Really spend some time answering these questions and figuring out what topic you think you could write about. Don’t get too caught up in the money potential of blogging just yet. The last thing you want to do is choose a topic just because you see others making good money writing about the topic. If you choose the right topic, one that you can write about consistently, then I guarantee you there will be a way to make money from it. What do you want to do every day for the rest of your life? I hope you see the importance of choosing the right topic. Every house needs a solid foundation and so does your blog. Okay, you have your topic and now it’s time to move forward. Now it is time to choose your domain name. Ideally, you will want to come up with a domain name that contains keywords or clues into what your site is all about. Take my site Gen Y Finance Guy for example. My target audience is Generation Y and my chosen topic is Finance. It’s also good to try and come up with a name that is easy to remember. Most experts out there recommend that you choose a domain with 3-5 words. 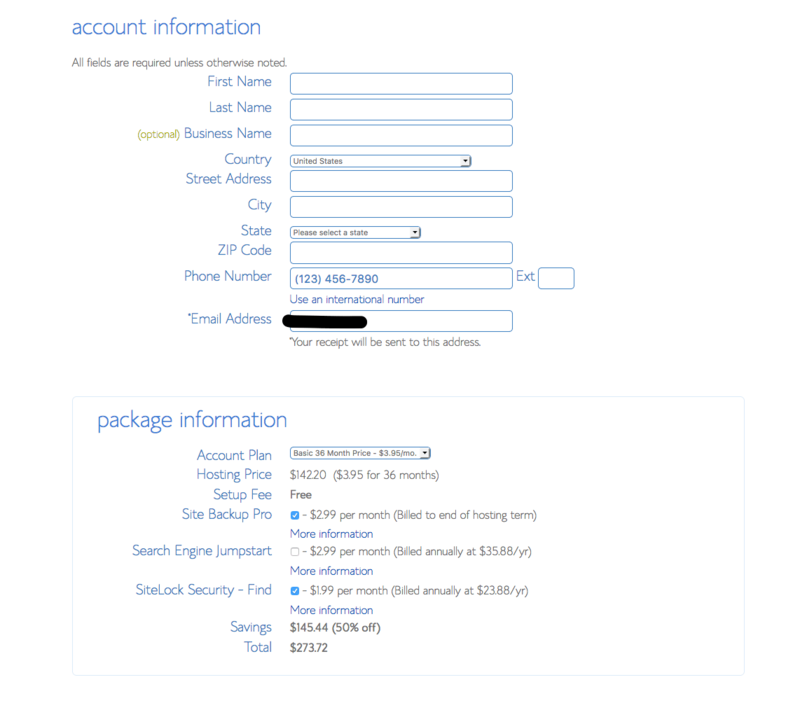 You will notice that in order to get the best price at $3.95/month that you will need to pay 36 months up front. But you’re in this for the long haul right? What other business in the world can you start for less than $150 bucks in the first year? Let alone for the first 3 years? Trust me it’s a great deal and exactly how I got started. Best of all they have a great refund policy if you decide this blogging thing isn’t for you. If for some reason you decided to cancel they will give you a prorated refund. So the risk is as low as it can be, plus don’t forget they are also throwing in the FREE domain name (that normally costs $10 to $14 on its own). 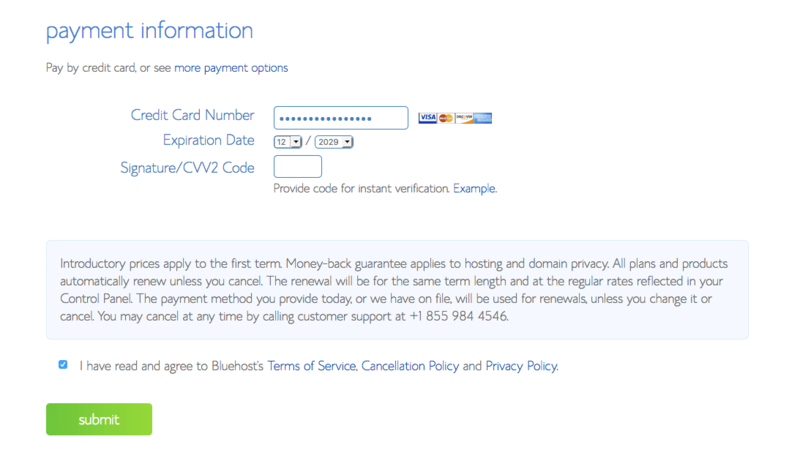 Finish filling out the page with your personal details, payment method, and then submit. Note: you could get a free blog by using a site like blogger.com or wordpress.com. However, if you intend to make money and have full control and ownership over your content you will want to make a very small investment and pay for a domain and basic hosting package. You will have the most flexibility to monetize and customize your site if you own it. I actually had a friend a few years back who had a free blog on blogger and Google decided to shut him down and he lost 2 years worth of content that he was never able to get back. 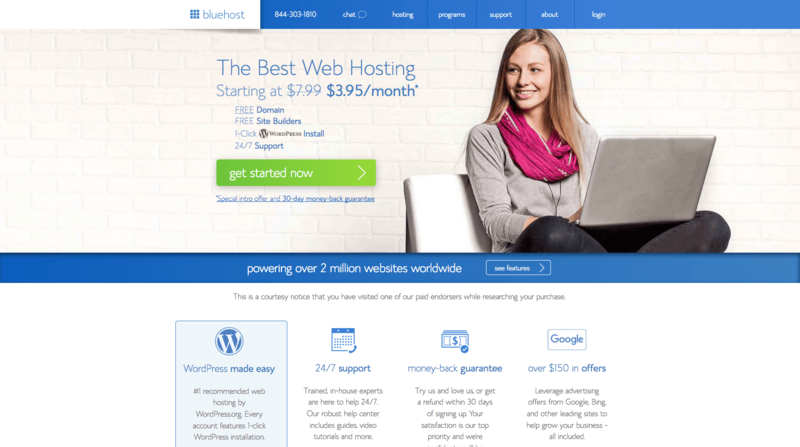 Once you have finished the registration process with Bluehost you will want to install WordPress onto your new website. WordPress is a blogging software application that makes managing and customizing your blog super easy. 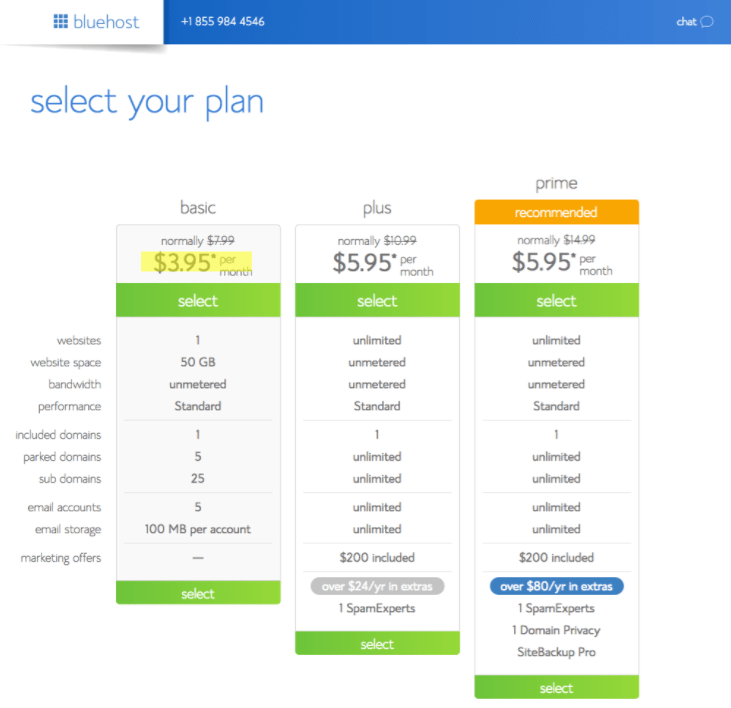 Not only is it super easy to use, but Bluehost makes it super easy to install with just a few steps. Think of WordPress like a car that comes with an automatic transmission instead of a manual. 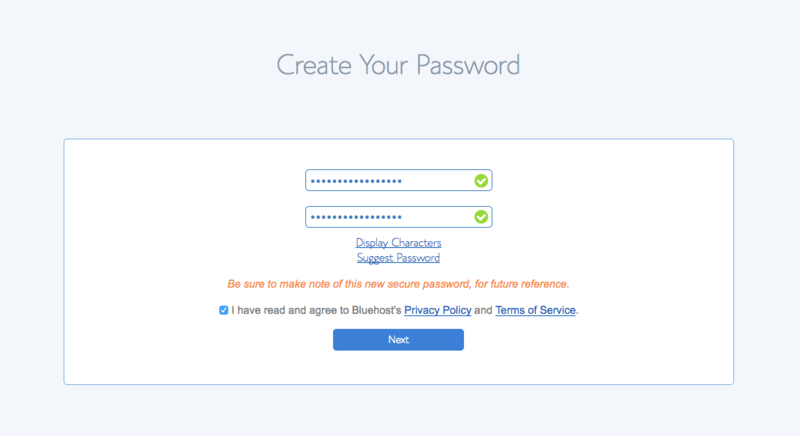 After creating your password, Bluehost asks you to pick a theme. You can always change your theme later, so its no big deal if you don’t love the theme you initially select (see below). On the next screen click “Start Building” button. I told you that it would be easy. Could you imagine what setting up a website used to be like before software applications like WordPress? 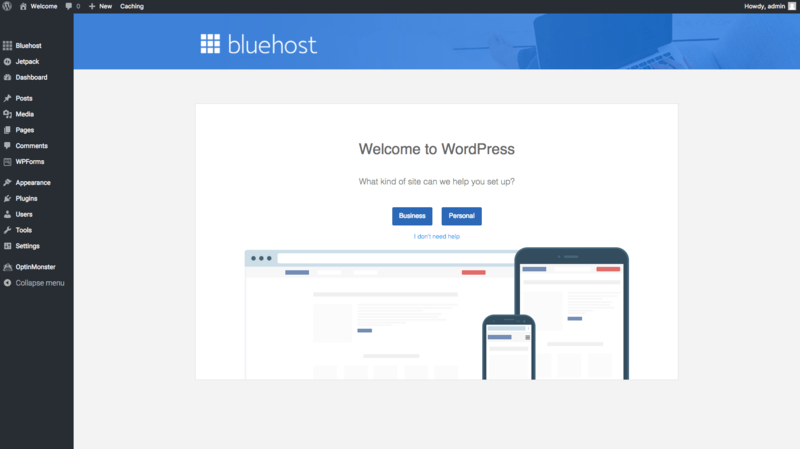 This is how you will be able to access your new website to write blog posts, customize the theme (the way it looks), and manage everything else related to your blog. 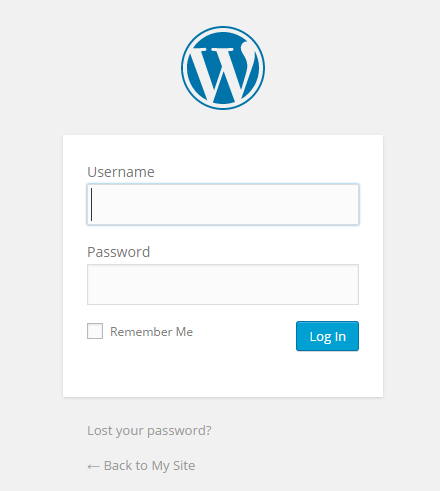 You now have a WordPress blog. Now you just need to work on the design and producing content. I recommend that you just “Launch” your site on the next screen right away. The reality is that no one is going to be visiting your site at this point, so it doesn’t matter that it is live while you are still making design updates and working to get content published. The wizard will walk you through the steps to get your site live (see below). 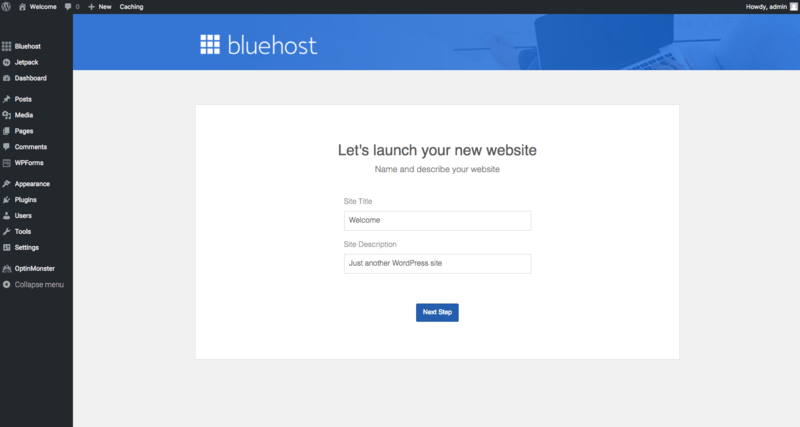 Are you ready to login to your new site? Type your Admin URL into your web browser. You’ll see a login screen like the one below. Enter your Username and Password you created during the sign-up process. Note: your admin URL is your sites web address appended with “/wp-admin.” For example, the login for me is www.genyfinanceguy.com/wp-admin. You are officially logged into your new blog and you can begin writing blog posts, adding pages (like “About”, “Contact”, etc. ), and picking a theme (this controls the way you site looks). During your install, your blog was installed with the theme you chose, but you can always change this at any time. Now that you are able to login to your website it is important that we take care of a few technical pieces that go along with starting off your blog right. The list of plugins I am about to list are what I consider mission critical to have a solid foundation to your new blogging venture. However, let me preface that with the fact that this is not an exhaustive list, and in fact there are thousands of plugins out there. Do keep in mind that the more plugins you install the higher the risk of issues you may have down the line with incompatibility. I am not trying to scare you away from plugins because they are absolutely a godsend in making some of the more technical aspects of blogging so easy. It is just better practice to only use the plugins you absolutely need. Google Analytics by Yoast – This plugin makes it simple to add Google Analytics (GA) to your WordPress site, adding lots of features, e.g. error page, search result and automatic outgoing links and download tracking. We will cover signing up for a GA account later in this guide, but this plugin makes it as easy as copy and pasting your GA ID and voila! You’re going to want to set GA up as soon as possible because this is how you are going to measure the effectiveness and success of everything you’re doing online. Akismet – Used by millions, Akismet is quite possibly the best way in the world to protect your blog from comment and trackback spam. It keeps your site protected from spam even while you sleep. This plugin automatically checks all comments and filters out the ones that look like spam. In the beginning, you won’t have that much spam, but it does grow as you grow. No need to publish useless comments. SumoMe – Free Tools to grow your email list. It is going to be very important to start growing your email list from day one. This tool integrates very easily with all of the major email platforms like MailChimp and Aweber. I personally recommend Mail Chimp because they allow you to use their platform for free until you get 2,000 people on your list. But we will get more into list building below. For now, just make sure you install this plugin. WordPress SEO – The first true all-in-one SEO solution for WordPress, including on-page content analysis, XML sitemaps and much more. SEO won’t be your primary focus early on because it will take months and sometimes longer before the search engines start sending you traffic. But this plugin is going to help you easily input the important elements that help the search engines determine whether the content on your blog is relevant and a good fit for a search query. It will also automatically generate an XML sitemap for your site that basically gives the Search Engine a blueprint of your entire site. This is what they call indexing. Pretty Link Lite – Shrink, track and share any URL on the Internet from your WordPress website! This is going to be really important when we start talking about affiliate marketing int he monetization section below. This is a plugin that is going to allow you to cloak your affiliate links and make them “invisible” to the search engines and more friendly to your visitors. Microblog Poster – Automatically publishes your new blog content to Social Networks. Auto-updates to Twitter, Facebook, Linkedin, Google+, and more. This is a great tool to get your content out on social networks without any additional effort from you. Quick Adsense – Quick Adsense offers a quick & flexible way to insert Google Adsense or any Ad code into a blog post or widget. Another plugin that will be critical once we get into the monetization section. WP Smush – Reduce image file sizes, improve performance and boost your SEO. We don’t live in a dial-up world anymore, people have come to expect a fast loading website. This plugin along with the next one will help keep your site light and speedy. W3 Total Cache – This plugin is designed to improve user experience and page speed. It caches certain elements of your site that don’t change very often so that subsequent load times get reduced. Let’s say a visitor comes to your homepage for the first time and it takes 4 seconds to load. When they come back that same page may only take 3 seconds because it now has a stored copy of the static elements of your site. Simple Content Templates – Over time you will likely want to create a template that you use for your posts and this makes it super easy to do. For example, I have started including an email capture form at the end of each of my posts. This makes that easy to set up once, so that every time I start typing a new post, this is automatically included. These are the 10 plugins that will have you running sprinting out of the gate at launch. Like I mentioned above, this is not an exhaustive list, but form my own experience these are the ones that I would classify as mission critical. As a frame of reference, my blog is only running 15 total plugins, 4 of which are specific to my premium theme. The next step in building your blog is choosing a theme. 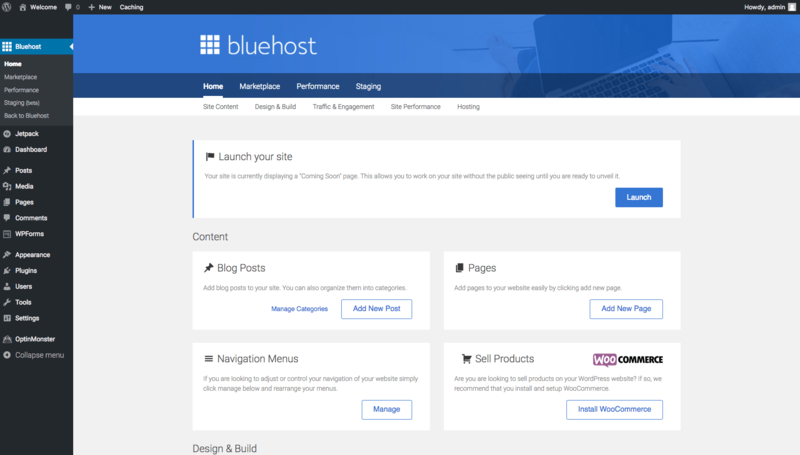 A theme allows you to control the look and feel of your website. 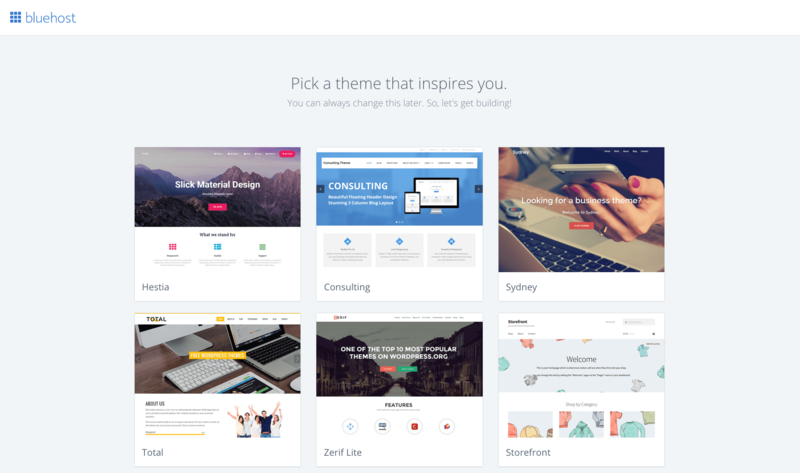 WordPress carries hundreds of FREE themes that you can choose from. At some point, you will probably want to pony up and pay for a paid theme, but I think it is totally okay to start out with a FREE theme when you start. That is exactly the route I took when I launched my blog. In fact, the FREE theme that I recommend is called “Convac Lite”. Note: Eventually I updated to the X-Theme in order to achieve the look of a more professionally designed site. 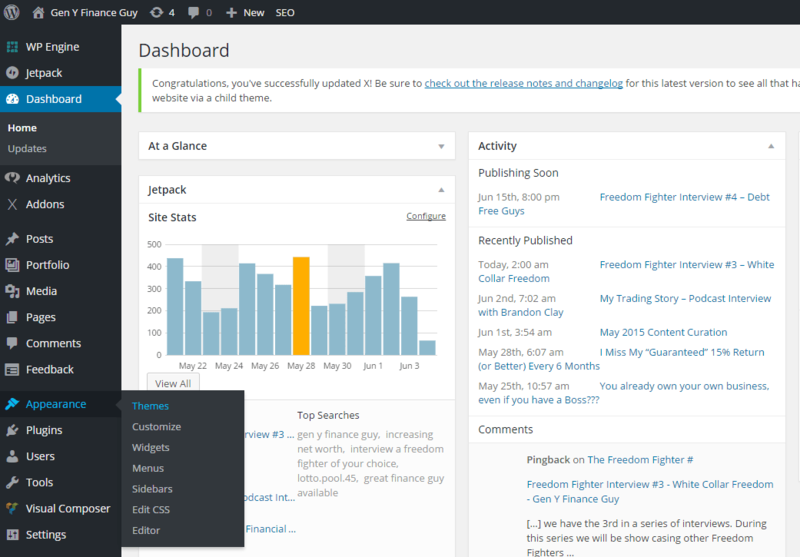 It also comes with way more options to customize and has built-in tools that make your blogging life easier. Let’s just say it was $65 well spent. And the only other thing I would point out is that you also have the option of paying for a custom designed site that could run you anywhere from $300 to $3,000 depending on who you go with and what you are trying to accomplish. But you can cross that bridge when you get there. You will notice from the screenshot above that I have already installed the “Convac Lite” theme that I recommended above. 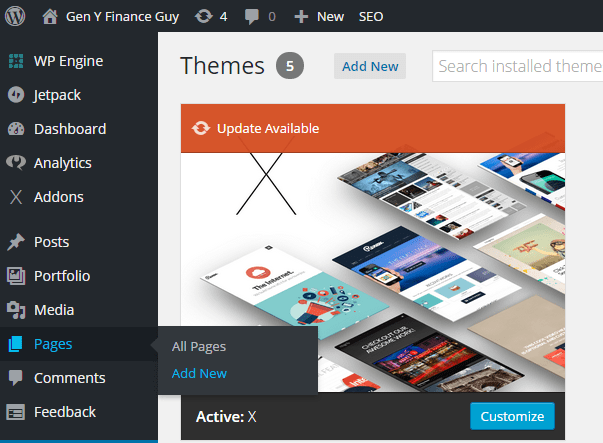 In order to browse and search the Free themes that WordPress provides, you will just click “Add New” in the screenshot above. Then once you find the theme you want it is a two-step process to get it live on your site. Once your theme is active you can then customize it to your liking. Pages are usually where people ended up landing when they click a button or link from your menu bar. Two of the most popular pages that you typically find on every site on the internet are the “About” and “Contact” page. These are probably the two I recommend you start with and you can always add other pages later. Note: Going forward I am going to assume that you are already logged into the admin panel of your website. So I will be omitting that as a step. Once you finish populating your new page with a title and your content you can either publish to go live immediately or save it as a draft to come back and work on and make changes at a later time. You are officially a blogger. It is now your duty to create content that incorporates your unique story and view out to the world. There are people waiting for someone like you to relate and connect with. There are people out there that need to learn from you. The world is waiting for that something that only you can give. Do not take this position lightly, people are depending on you. p.s. After you work through this list and while I work on other segments, check out the comprehensive guide my friend George created at First Site Guide. p.s.s. Want more? Check out a post my buddy Matt wrote on 50 reasons why you should blog.